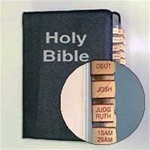 Bible Index Tabs for your Holy Bible. Also available with Apocrypha tabs. Are you looking for something to help you navigate the pages of the Holy Bible faster and more efficiently? Well look no further! Bible index tabs make finding your favorite scripture easier than ever. Our index tabs come in two classic styles: burgundy/gold and silver/black, and each style fits seamlessly into any Bible. And because Bible index tabs are round, they won't tear those thin Bible pages! These tabs can also be purchased with the Catholic Apocrypha tabs or in Spanish! Bible tabs make a great gift too! Bible index tabs are sure to make your Bible study sessions much easier! Bible Index Tabs in Spanish make finding your favorite passage easy for our Spanish-speaking customers. Best of all, our Bible Tabs will never tear your pages. Bible Index Tabs make finding your favorite passage easy. Best of all, our Bible Tabs will never tear your pages. This set also includes 6 Catholic Apocrypha index tabs. Copyright © Lawton Printing Index Division. All Rights Reserved.